HALF TIME - Score slightly flattering to Vipers with Sloppy showing some good movement. Vipers mostly catching Sloppy on the counter break. James Purnell makes superb save diving to bottom left moments before half time. (Still no sign of 'sicknote' Steel). 11mins - 0-1 Inter Punani manager Mike Tremayne scores after Ed Knight mix up with keeper giving Tremayne an open goal. 20mins - 1-1 Vipers continue to press and scramble in the box leads to Punani player falling into goal with the ball. 40mins - 2-1 Vipers take lead as the impressive Will Sykes slots home on his debut. 63 mins - 3-2 Stern scores after good build up from Gaffer. 90 mins - Last gasp pressure from Punani fails to find equalisers. Vipers win 3-2. Vipers dominate first 10 mins with great passing football. Punani duo, the Hoffan brothers, fail fitness test and Mike Tremayne has to recruit two new players at the last minute. Vipers played well in first half but struggled to convert pressure into goals; half a dozen chances fail to beat Toby skinner in goal. This was not the greatest game. Things started badly when once again the Stragglers turned up a man short. This time the excuse came from Aidan Cooney, "I am stuck in Essex" he barked down Barber's phone and with Van Cutsem typically running late the Vipers reluctantly were forced to hand over a man to make things equal and get the game started. Ed Tremayne, having played cricket for the Stragglers, was the gallant volunteer this (and hopefully for the last) time. Once the game go going, the first half was really one to forget. Not helped by swirling winds the ball ended up out of the ground on numerous occasions. When the ball was on the deck, the vipers had the greater of possession and despite a number of chances nothing that really threatened their keeper. Ten minutes before half time a long ball took an unlucky deflection off the Vipers Centre half, Ed Knight, and Ed Van Cutsem was able to round James Purnell to slot home (1-0). With both Steel & Josh out for the Vipers and Bill Hurst for the Stragglers there was a possibility that this match would go off without incident; that was until Ginola and Henry Cecil took up the honours exchanging blows just before half time. At the whistle, James Purnell took it upon himself to tell his team-mates just how he felt they were playing. The Vipers roused the performed much better in the second half. With 25 minutes left Stern tapped in a well deserved equaliser and the floodgates opened. Dougal Christie added to the account shortly after. Then Matty Neal, making his debut, scored with a superb individual effort dribbling down the left. He scored again before a great strike from Ginola into the top left completed the Vipers' account. With no Edmond Tweedie, Ed Knight deputised and Beetle and him gave the Vipers back four a new solid partnership. At the end of the match Tom Barber notably refused to shake Ginola's hand. No doubt they will renew their friendship when these two teams meet again on Feb 8th. Eton go for youth as three 1st XI players drafted into squad. 0-2 Dinger again - outpacing defence to hit low shot in. 1-2 Cross from right wing. Gets in front of vipers defence for Eton to poke home. 2-2 Glen Pierce dive wins free kick that Vipers again fail to clear. Lack of wall. 4-3 Battersby volley - Great goal. 5-3 Stern header from Ginola cross. Impressive Tim Carswell in goal. Clayton only one annoying back flick. Vipers resurgence brings them back to 3-3 with goals from Ginola and Steel. Again poor defending and Harrotians take lead once more. Gaffer pushes up and fires home - sending keeper the wrong way. Last kick of game, Harrotians run down left and score. Duff in goal. Another great game (for the neutral). With both sides looking shaky and Frost 20 mins late drunk between the goal posts it was always going to be an open match. The Vipers took the lead courtesy of Dan Stern. A Harrotian goal was ruled out after the ref judged their player to push Daumy out of the way. Then a mix up between Harley and the keeper allowed the Harrotians back into the game. The Gaffer restored the lead with an absolute pelter from 40 yds before Frost let one through his legs. The Vipers sneaked home courtesy of a Battersby (?) winner. Trevor Tremayne (his father) reports from his viewpoint (a cell window at Wormwood Scrubs). Terrible pitch, Terrible finishing, Terrible defending, Great Result was how Vipers midfielder Olly Battersby described it. It was a momentous occasion prior to kick off with the travelling fans (and prisoners) welcoming James Fraser back for his first appearance in a Vipers shirt for eleven months. He played well but agreed afterward that he was somewhat lacking in fitness. The first half started at a pace with the Vipers making some surging runs up the left. Harley, who had been left out of the side on the previous two occasions, was keen to make an impact and the Gaffer seemed to notice his impressive work rate. The Tractors posed little threat early on and the Vipers pressure was converted into a goal after just seven minutes when Dinger slotted home his second chance of the day (1-0). This seemed to wake up the Tractor Boys and they counter attacked. The Gaffer, swapping places with Purny (who had injured his hand but not his feet), had to make a few saves but let one slip after 15 mins and the ball crept over the line just before the Dufster could get to it. The pendulum swung the other way and seven mins later Dinger restored the vipers lead with a decent volley. It was a bit of makeshift Vipers side but Duff Gordon impressed and Purney, at right back, showed he can play as well as he keeps. This sunny Sunday afternoon game was a strange one in which the Vipers upped pace in second half, following a lack lustre first half, to see of the WLA challenge. Wilkins opened the account with a tap in after a 20 min deadlock (The Vipers holding out with 9 men after Hanson delayed one of the team buses). Contention followed with the linesman disallowing Steels goal (part of a 8 man move) while giving West London a blatant offside. West London then took the lead with a terrible blunder by the Vipers keeper, Noel, making his first and last appearance in a Viper. The vipers responded with screaming header from a corner by Tractor, his first for the club, for the Vipers. Noel went on to give WLA the lead (3-2) before a stirring war cry from Esmond saw the Vipers up the tempo. Tremayne was first to take action with his second ever goal for the club (a rebound off the keeper following a corner). His celebration was to remind Tweedie that he had overtaken him in the all time scoring charts. Dauman, making his first appearance of the season, was impressive and added a brace. Steel added to the tally with a free-kick and Wilkins with a penalty. The Vipers ran out comfortable 6 - 1 winners last night at the Battersea Astro against rivals Buchanan's Scratch. 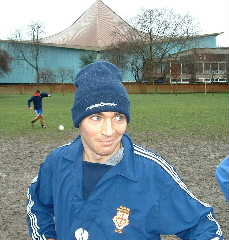 After Buchanan submitted a team sheet including a blue and which on reputation was considered a strong side, the Vipers judged this a match which needed strong mental and physical preparation. It looked tight in the first five minutes as the Vipers failed to gel and repeatedly gave the ball away on the left flank, whilst M Palmer looked pacy and dangerous against the right flank's defence. Indeed Hill-Wood could easily have put Buchanan's Scratch one up but was well dispossessed by Bailey in the 6 yard box. Within 10 minutes though the Vipers began to show a dominance that was to last the remainder of the match. The flanks stiffened to the challenge and Steel and Wilkins began to latch onto more ball in central midfield. For the opposition Muir played aggressively throughout and received and dished out some ferocious challenges. All the while Lloyd was showing some delightfully deft touches on the edge of the penalty box and set up Wilkins for a couple of goals which saw the Vipers at half time 2-0 up. There was still a lot to be played for and Vipers showed the nature of their half time talk when Wilkins steamed into Muir within 3 seconds of kick off. There were some terrific moves played out by the Vipers with the midfield all gelling well. Width was supplied by Clayton and Stern and soon three more goals were scored with excellent moves, Stern, Steel and Lloyd all getting on the scoresheet. At 5 - 0 the Vipers rather took their foot off the pedal and Buchanan's scratch began playing for dignity. Moss managed to steal round the back and grab a consolation goal but only after Purnell had made a couple of outstanding saves - not bad for a keeper with one eye. After being lambasted by Tweedie for showboating, Ginola replied by juggling the ball around about 30 yards out and then crashing a volley over Duberly's despairing dive. The final score of 6 - 1 was pretty representative of the Vipers superiority and rather lacklustre performance from the Scratch. Scorers: Stern (2), Battersby (2) & Steel. Eclipsing the Vipers in stoppage time, Arthurs Feet committed almost an act of piracy. They grabbed a point totally against the sway of the game and with a goal so late that the opponents barely had time to kick off. Sven Goram Cadbury was so gutted he shunned the post-match press conference as he now knows that it is going to be difficult for his team to pursue his Premiership dream. Throughout the game, the Vipers were the master team, with Moss's team suppressed by superior tactics and by a seemingly superior opponent. And yet the Vipers had been disrupted as early as the 15th minute when Glynn Austen-Brown grabbed the lead. Even so, the Vipers were a sterner team throughout the first half, and deservedly led on the half-hour. Alex Clayton, slimmer than last year and very definitely in more vigorous and determined form, showed his intent by getting between the ball and the keeper to equalise. Within seconds, Clayton, a more powerful force than de Maupou, was winning the ball back and then, with splendid invention he snaked a deft cross behind de Maupou. Then moments later Battersby made the second with a swift and clever run to reach the ball in the nick of time and instantly flick it over the onrushing goalkeeper. We then had reason to believe, as we have periodically this season, that the Vipers had the mettle to crush the sorry Feet. However, ten minutes before half-time, carelessly and inexplicably, Harley clashed with a Foot. It was an innocuous challenge but the man in black pointed to the spot and Austen-Brown slotted it home. Later a surging Cadbury, now promoting new white boots, guided the ball splendidly into the six-yard box, but the Vipers attack failed to sweep it up. However, moments later a scrap in the box saw Ginola give the Vipers the lead (3-2). The second half was curious because Christie, Tremayne, Bailey, and especially the imperious Cadbury, had been so much in control of their area that they made Fetiveau look inept and with the Vipers looking in control enabled their fans to spend so much of the game mocking the "Edinburgh muppets". The Vipers also carved out opportunity after opportunity. First, Ginola struck the crossbar with a fantastic volley. De Zoet made two agile, almost elastic saves, diving low to his right to deny first Lloyd, then Wilkins. The opportunities were wasted and a goal from Fetiveau ruled offside gave the Feet hope while a similar ruling from Lloyd's run only served to frustrate the Vipers further. When Tweedie took off Wilkins the pendulum swung. In the 93rd minute the Feet won a corner. The ball was lofted into the Viper box. Fetiveau saw the opportunity in an instant and struck the ball high into the net from inside the penalty area. The Vipers learned the harsh way that fluffing chances does not pay. Feet: Jim de Zoete, Gromit, Fred Lawson, Tom Walker, Dave de Maupeou, Will Robertson, Tony Daukes, Charlie Tweddle, Mark Selby, Henry Moss, Olly Fetiveau, Glynn Austen-Brown. Goals galore last night in a thrilling Durham Derby but the Vipers must be waking up this morning and asking how they threw this match away. 4-2 up at one stage they had it in the bag but with 40 mins still on the clock they let their lead slip and were even 6-5 down with 12 mins to go. After just 4 mins the Stragglers, on their first encounter into the Viper half, managed to neatly draw three Viper defenders into the left and open up a gap for the surging Black to hammer home. This was very much against the run of play and by sticking to their game plan the Vipers levelled only ten minutes later. However, a cruel deflection from a Barber shot moments later left Purnell wrong footed and put the Stragglers back in front. The Vipers once again surged and their second goal was pure football. Ginola shimmied twice before finding Stern on the left wing. He went round a Straggler and put in a beautifully weighted pass allowing Wilkins the find the net from close range. Just before half time the Vipers took the lead when Lloyd beat the Straggler offside trap (2-3). Their football at the time was afterwards described by Barber, the Straggler manager, as "the best football I have seen on a Straggler pitch ever". Their defender Allision added, "It was a joy to watch". Half time was frenetic as both Gaffers tried to calm their players down - realising that continuing at this pace was going lead to some tired errors. The Vipers continued where they left off and got the two goal cushion they so deserved. However the Stragglers pulled themselves back into it, thanks to some sloppy defending from a corner, and once again had the Viper manager calling for his lads to restore that two goal cushion (3-5). They duly did before pressing the self destruct button. Wilkins and others started to concentrate on personal feuds rather than their game plan, Steel and Harley both playing their first 90 minutes for more than a year started to wane and Clayton, filling the boots of left back, looked less and less comfortable. The Stragglers then scored three. Two of them could almost be described as 'fluky' including one from Hurst, who at 34 was the oldest man on the pitch, saw his cross serve into the net. This time it was the Stragglers who waned as they struggled to hold out for the remaining 12 minutes. Lloyd hit the equaliser - his 4th of the day and 7th goal in two matches - and the Vipers pressed for the winner. It wasn't too be and a delighted Straggler team slumped with joy as the full time whistle went. The Gaffer later added "This is the second time we have let a lead slip (Eton being the other) and I urge my players to get fitter for face the drop. Having said that, the Stragglers are extremely difficult to mark as they play with no particular shape. We look forward to the 2nd leg on the 8th Feb - it makes me exhausted just thinking about it." Viper Goals - Lloyd (4), Ginola & Wilkins. Straggler Man of the match - Black; Viper Man of the match - Ginola (worked tirelessly and kept the crowd entertained with his usual bag of tricks). Tonight's victory was marred after rumours circulated that hot-headed Esmond was involved in a fracas in the tunnel after the match. Both managers however declined to comment. The game on the Tractor Boy's small pitch was tight but the Vipers could have scored more with Battersby hitting the post 3 times. Ginola played well up front well and did an excellent job holding the ball up for his team-mates. Jim Harper, making his Viper debut also looked promising. Viper striker James Fraser who tragically broke his leg in last seasons end of season clash with Inter today threw out his crutches in the first step of his recovery to becoming a Viperete favourite again. He exclusively told Vipersfc.co.uk that he is looking forward to a few rounds of golf before hopefully running out for the Vipers in March 2003. Vipers FC cannot wait to have the lad back the Gaffer told us. Ed Van Weazels loan spell with the New York Jets has come to a premature end. The dutch midfielder was rumoured to be homesick and the Vipers have sold him to PSV in return for a new strip. He will be residing in Amsterdam with former Viperete Misch where he will be personally involved in designing the new Viper look. Affected by the tube strike a makeshift Vipers side gelled together well to gain revenge for the Harrotians earlier victory. Goals from Bailey (a good strike from the edge of the D), the gaffer (volleying home) and Deedes (slotting home from the Gaffer's assist) ensured the Vipers got all three points. Harley started to realise his former potential. The Vipers management told their fans that they wouldn't let todays tube strike get in the way of tonight's game. They vowed they would get to the game by foot if that was what it took. Fresh from their first defeat of the whole year the Vipers are keen to make amends tonight. Kick off is 7pm. Read the report on the Tractor Boys' website (link is below). Team: Frost, Clayton, Harley, Ginola, Tweedie, Gaffer and Wilkins. Goals from Wilkins (2) and Ginola. The Chairman's note in the match programme may come back to haunt him. He wrote, following the John Terry/ Jody Morris fiasco, football needs to show it has learnt from its lessons, to this extend I have banned by players from visiting nightclubs. The News of the World may have not made great reading this morning when it implied that half his team had been out boozing the night before such a big fixture. The Vipers started well and a great through ball from Kenny found Ginola who lifted the ball over the Eton keeper to make it 1-0 after 10 minutes. However the Vipers soon faded and before they knew it they were 3-1 down. 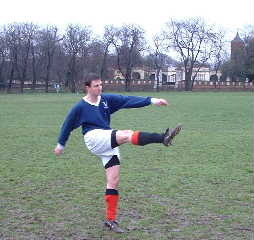 They nearly went 4-1 down but the Gaffer made a series of great tackles on the ageing Glen Pierce. This spurred the players back into action and two quick goals from Kenny gave the Vipers a glimpse of hope that they would go on to win this match, least of all get a point. However, with 5 minutes to go the Beaks clinched a winner with a great goal and with it took the Vipers unbeaten record in 2002. 2-0 down at half time the Vipers must have felt they were facing a huge injustice. They had totally dominated the first half but first an unfortunate slip up between the keeper and defence, then an unlucky deflection gave Bollox two gifted goals that were swept up by the as always sharp Harry Hoffan. It required an uplifting talk at half time to raise the spirits of the Vipers and from the outset of the second half they took the game by scruff of its neck. It wasn't long before they had wrapped up the game with a hat trick from Matt Lloyd and two goals from the impressive Willem Dinger making his league debut for the Vipers. Bollox player Garwain Davies conceded afterwards, "We were outclassed". Bollox included: G Davies, Harry Hoffan, Harry Duberley, Simon Henson, Charlie Hill-Wood & Charlie Wilson. With the need to balance the books in time for the transfer deadline there has been much speculation about the future of various Viper players. Harold Lucavic has been linked with Temptation Island FC, Methven is rumoured to be joining Colville in Married Men dont go out FC, and Frost was tipped to be sent out on loan to Ireland. Vipers FC don't comment on speculation. Some anonymous emailer has been ruffling the feather of some members of the Vipers Senior management as well as Arthur's Feet players using the name Sven-Goran Errickson [svengoranerrickson@hotmail.com]. While he can't spell his own name he prank is causing quite a stir. The fixture list for 2002-03 was today released by the FA. The Vipers will kick off their season against Real Bollox on Sept 8th. Vipers keeper James Purnell has been suspended by the FA until Sept 21st after he revealed in his imaginatively named new book, 'Purnell - My Game', that he meant to break Arthur's Feet player Henry Moss's leg in a challenge last season. He wrote, "Moss is a git. I tried to end his game." NEW YORK JETS SWOOP FOR VAN WEAZEL IN PLAYER EXCHANGE. Miles Harley is back. His loan period with the New York Jets has come to an end and the club have opted to take Ed Van Weazel in his place on loan until the new year. Miles said, " I have put on a bit of weight but the Gaffer has put me on a special regime to get fit in time for the new season." Special Milo Extra Extra large shorts are available from the club shop. In the highly prestigious players and wives dinner last night Josh Wilkins was the winner picking up the award of Player of the Year. Other awards went to Ginola (Golden Boot), Gaffer (Goal of the Year) and Alice McInnes (Sexiest Viperete). The players and their lovely ladies danced the evening away at the classy Diva Nightclub in South Kensington. Photos are now available on the photo page. The Vipers ended the year unbeated last night with a convincing 3-1 victory over the Harrotians. Goals from Clayton, Lloyd and Ginola meant the Vipers were just too strong for the Vetrans. Exacting revenege on the team who got the Vipers off to such a poor start back in August was said to be "sweet" by Esmond. Sven Goram Erikson received a hammer blow last night when Vipers striker James Fraser broke his leg ruling him out of the world cup. The Vipers were trailing Inter Punani 4-3 at the time but had come back from 3-0 down at half time with a strong resurgence. Fray's Viper team-mates were said the be "gutted" for the lad and are keen to see him make a speedy recovery. Many have been to see him in hospital and said that he was putting on a brave face. The Vipers had shown through their form in earlier matches that the annus horribilis they endured had ended. With hindsight it is easy to see the spiralling drink problem and spice boy image in the club go unheeded: Ginola and Hanson, such an effervescent partnership on the pitch had been enjoying the bubbly too much. The lure of dancing with media celebs, pulling posh totty in trendy night spots such as Attica had proved irresistible and these celebrations off the pitch spread a blue and white funeral pall on it. Those dark days are now gone, and how. It was a balmy March evening, a great night to play football as two sides ran out into the floodlights of Battersea AstroBowl. Emotions ran deep between the two sides; the Vipers requiring a cathartic reversal of the 4-1 drubbing they suffered earlier in the season, Buchanans Scratch playing for personal pride. It was a fantasy first period for the Vipers who played their opening gambits with dazzling efficiency to lead their opponents by 2 goals to nil in 10 minutes. Clayton was razor sharp on the left carving out repeated through balls for the speedy Lloyd and Ginola up front. Claytons football, so delicately balanced on a tightrope of confidence, is soaring like Blondin over Niagara Falls at the moment and long may it last. It was a great move that put Ginola through to score the first and when Matty Lloyd chased a lost ball to the byline with typical fervour, and beat the keeper, 2 0 it was. At this point the Vipers were floating on cloud nine and had Lloyd not missed the simplest of chances to put Buchanans team 3- 0 down it could have been a rout. Instead the opposition kept their heads held high and scored from a rare corner. Meanwhile the Vipers had started without their recent big money signing from St Andrews, Oli Battersby. Battersby, returning from a trip to his roots in humble Lancashire, was late. However, Van Wezel, despite an obvious hangover was making valiant efforts down the right but just before half time was swapped for Battersby. A rousing speech from the Gaffer kept the Vipers on their toes and again their thrusting panache and intelligence was rewarded by Alex Clayton who finished a sweet move from close range. Then much against the run of play someone from Buchanans team inches the ball over the line and its 3-2. The Vipers are often prone to defensive frailty at key times such as these but Tremayne especially harried and tackled with the venom of a true Viper. In fact for 30 minutes Buchanans Scratch were held comfortably at bay enabling the forwards to asphyxiate the last breath from Buchanans Scratch in a tight grip of pythonesque proportions. Ginola and Wilkins, a human dynamo and the central hub of the team, both score and effectively put the game out of the opponents reach. Victory is compounded when the Gaffer sells the goalkeeper a dummy by appearing to put a long cross into the box but he cleverly changes the angle of his foot at the last minute so slicing across the ball and lobbing the keeper from 35 yards. A brilliant solo effort and he is mobbed by his team mates. Now the Vipers were showboating and consequently concede two sloppy late goals but this cannot detract from another committed performance from the team who are now beginning to gain momentum. A rolling stone gathers no Moss and that particular anti-Viper soccer mercenary is being put to the sword at every opportunity. All credit must go out to the opposition, particularly Charlie Payne who played excellently, but even that sort of ability could not deny the revamped Vipers their fifth win on the bounce. One could analyse the teams resurgence to death: Pernells gifted acrobatics in goal; Wilkins holding the ball, providing the easy pass for the defence and distributing fairly; Tremayne and Tweedie maturing as defenders; the aforesaid renaissance of Ginola and Hanson; confidence sweeping through the team; Swan drinking too much at lunch and falling asleep so missing the entire match; Battersbys incisiveness and ball retention abilities; Dauman careering down the line on the overlap. Who can say what is the most important? But as the great Sid Waddell said: it has been the greatest comeback since Lazarus. Spittting Vipers Spitting! It was a great match with the Vipers showing true grit to come out worthy winners but sadly it won't be remembered for that. Instead it will be remembered for THAT GOAL ! The goal scored by Viperete's favourite Sven Goram Gaffer. Leading his team into this match he sealed the game up with a wonder strike that even had the opposition applauding. It was something even Roy of the Rovers couldn't have dreamed of. Talking the ball on the right of the pitch the gaffer would back his leg to strike the ball inch perfectly over the finger tips of an ailing Bodie in goal and into the top right hand corner. All this from 40 yards. The goal of the season competition must surely be now closed. Other scorers included Clayton, Ginola (2), Lloyd and Josh. Clayton was man of the match. Last night, in deepest darkest Essex, the Tractors finally made it into the net, not only on the pitch with an emphatic victory, but also at www.tractorfc.freeserve.co.uk. Sadly for John Deere, their manager, they are too late for their shareprice to benfit from dot-com bubble but with a huge grant from the Common Agricultural Policy (CAP) they have raised the funds to enable you to post a message, e-mail their Gaffer, read the latest match reports or even submit your own. They hope to add more content with time. "It wasn't a pretty game but we showed our growing character as a team by grinding out this result" was how Vipers Gaffer Sven described yesterdays result. The Feet threw everything they could at the Vipers with a team described by one Feet fan as barely recognisable; four feet players made their debuts yesterday as Moss tried, in vain, to fill the Feet side with 'more experienced' players. After 70 mins the game looked like it could be heading for a rare goal-less draw. However, the Vipers could have been 2-0 up a lot earlier. 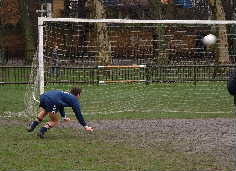 First Battersby's tap into an empty goal somehow got stuck in the mud on the line and a good link up between the pair of Lloyd and Ginola saw the plucky Lloyd's finish disallowed due to a highly controversial decision which deemed the player offside. The decision saw an outburst of rage from Gaffer Sven who must have been wondering what he had done to deserve so many injustices. In three matches against the feet the Vipers have now been denied two goals to dubious offside decisions and one penalty for a deliberate handball. Nevertheless, the decision seemed to lift the Vipers and five minutes later they had a two goal lead thanks to Olly Battersby. This was preceded by an excellent save from Frost. Battersby gave a good account for the Man of the Match award but in the end it went to Esmond Tweedie. "Esmond showed us today why he is the current Viper's player of the year. He was everywhere - sweeping up all the Feet had to throw at him. He even headed the ball off the line" enthused his defensive partner Ed Tremayne. In the final minute, Ginola was booked for diving in the box. Vipers: Frost; Clayton; Tweedie; Tremayne; Gaffer; Van Weaz; Wilkins; Battersby; Hanson; Lloyd; Ginola. Sub not used: Dinger. Viper Superstar Ed Steel will not be playing again this season after injuring his shoulder whilst on International duty. 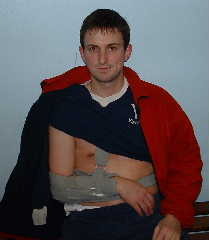 Steel, who was the Vipers 1999-2000 Player of the year, dislocated his shoulder in Slough on Saturday which showed his shoulder was still damaged after he dislocated it last season. A Viper team spokesman confirmed yesterday that the club as doing all it can to ensure Steel makes a speedy and comfortable recovery but warned fans not to expect the superstar back for eight months. Steel was said to be 'gutted' to be missing the match versus the Feet on 24th February. It is understood that SKY TV have asked him to join them in the gantry for the match to provide an insiders view from the Viper's dressing room. The Vipers' chairman is thought to be asking the FA to pay Steel's wages until he returns. "It is not fair that Vipers FC should be out of pocket due to a injury picked up outside the realms of Vipers FC". 4/2/02 - SING WHEN YOUR PLOUGHING. The Vipers went through to the 4th round of the Suffolk Ploughing Festival last night with a 6-5 victory over the 'Tractor Boys' (no relation to TractorHead Tremayne). keeper's legs. Only then did the Tractor Boys shake off their agricultural origins and without so much as an EC subsidy, come out the blocks with all guns blazing. Battling cyclonic wind conditions the Boyz pulled it back to 4-5 when, with 12 minutes to go, I missed a penalty and Steelo lobbed the keeper. It should be said that this was quite an achievement when one considers that the goals are only 1 m high and that Jamie, at 6'3, was not only the tallest player on the pitch, but also standing on his line. This gave the Viper's a 2-goal cushion, which was reduced to 1 before Harry Goad finally blasted the ball out of the stadium whereupon an under pressure Viper squad were only too happy to call it a day. 'Tonight I saw the seeds of some great players to come! ', remarked a grinning Tractorette, whilst others in the home crowd voiced the opinion that they'd experienced better shooting, 'out vole hunting.' "
Another match will be scheduled before the end of the season, most probably in early March. For the Tractors: Neil Bailey, Saddam, Del Crispio, Oli Barrat, Harry, Jamie and Philip N-B. The glory, glory years came back to the Vipers yesterday with some vintage football that saw the boys in blue hit the Durham Otters for five. This was the Otter's first defeat in their two year history which they lost in a distressing and abject way. The Otters had no answer to the athletic interchanges between Battersby, Steel, Wilkins and Van Weazel. All could have won the man-of-the-match award on a day when the goals came from all angles. "We haven't passed the ball as well this season and, even thought the pitch was in terrible condition, we played some champagne football" enthused the centre back Tweedie "This will give us a lot of belief". When the euphoria has dispersed though Sven, the Viper's manager, will know that his team are a long way from joining the elite of football history, but they looked a match for anyone in the country yesterday in what, from the first minute, was scintillating display. The Otters must have know that the Vipers would start the game a full throttle, but they seemed ill prepared for the onslaught. The first goal came from Lloyd who slotted home a great through ball but the forward should have had a more than a hat-trick by half time. He did get the second but that was before glaring misses from the Vipers' front line. It was just as well that the Otters had failed to establish any pattern. Outfought up front by the Vipers back four (not forgetting the excellent Purnell in goal), the Otters could not provide their normally lethal strikers adequate support and their cause became hopeless shortly after half time when they fell 3-0 behind. It was another move that carried the hallmark of training ground preparation as Steel crossed from the left for Battersby to chest down to Ginola who slotted the ball home, sweet and true. It became a rout when Van Weazel poked the ball in from the right and the party could begin in the 70th minute when he beat a defender to pop the ball through the ailing keeper's arms for his brace. Van Weazel who got two. "This was a bad hit for us," Herbie said. "The Vipers won every tackle and every second ball". The Otters will need to regroup before facing the Loyalists, whose manager Boyd was watching in the stands". For Sven, though, this victory will mean nothing if the Vipers don't build on this achievement. Bartez - Gaffer Sven - Esmond - Beetle - Another Tris - Van Weaz - Josh - Steelo - Battersby - Ginola - Lloyd. It is more controversial that the time Catholic footballer Mo Johnston moved to Rangers, Nick Barmby left Everton for Liverpool, or Sol 'Judas' Campbell's move from Spurs to Arsenal etc. "Mr J. Vincent and Miss C. M. E. Ferguson: The engagement is announced between Joseph, son of Mr and Mrs Robert Vincent of Fulham, London and Charlotte, elder daughter of Air Commodore and Mrs Anthony Ferguson of Quarley, Hampshire." Charlotte, who has won many prestigious Viperete trophies in the past (see 'Archive' section of this website), confirmed that she is marrying a player from the Viper's arch-Durham rivals, The Stragglers. Prominent among the burdens a modern football wife must bear is the perception that her life is spent answering the door of her large mock-Tudor home to Hello! photographers and slurping Malibu. But these are challenging times and the demands of the job are changing. There is, for example, the obligation to find decent parking spaces close to the jewellers of Bond Street, and to look suitably supportive during her husband's court appearances. Back in football's poor-but-honest days, a footballer's wife was typically a childhood sweetheart whom he'd rescued from a hairdressing salon at an early age, and whose consequent duties included buffing his boots before the match and queuing for his fish and chips after it. It didn't matter if she left her teeth out to go shopping and weighed more than the club's grandstand, because money and glamour had yet to descend upon the game, let alone contaminate it. Today, football is largely about power and appearances, and a player's wife must be part cover-girl and part Lady Macbeth. Charlotte may well do a good job in this role as she fritters the millions of a Straggler superstar but her most important mission will be to ensure that any off-spring of hers will be kitted head to toe in gear from the Viper's megastore and trained to hate the Stragglers "with a certain level of decency". Vipers FC offer the couple their warm-hearted congratulations. 1) "Sit down Pinocchio" - to the tune of 'Paolo Di Canio' (or La Donna E Mobile from Verdi's Rigoletto, we are informed by the only man in the office with a decent education). Sung by Arsenal fans, among others. 2) "We've got Dom Matteo. You've got Pinocchio" - to the same tune. Sung by Leeds fans. 3) "Hey, Phi-il Thompson (Ooh-Ah), I wanna know-oh-oh - where you got that nose" - to the tune of DJ Otzi's 'Hey Baby!' Sung by West Ham fans. 4) "Get your nostrils off the pitch" - to the tune of 'Who the F***ing hell are you?' or 'Bread of Heaven'. Sung by Arsenal fans. 5) "Big nose - you've got a f***ing big nose" - to the tune of Blue Moon. Sung by Leeds fans, among others. 6) "Thompson needs a nose job, Thompson needs a nose job, la la la la, la la la la" - to the tune of 'Ossie's Dream' or 'Let's All Do The Conga'. Sung by Chelsea fans. Esmond Tweedie will face a disciplinary committee at the RRFA (Rupert Rah Football Association) on Monday following allegations that he had an off the ball scrap with South Park defender Neil Ruddock. Tweedie, who was standing in for the missing Viper's Gaffer, did not lead by example in a performance that can only be described as 'Show Boating'. Despite their dominance the Vipers went into the tunnel at half time to a chorus of Boos from the Viperetes for their poor finishing. Battersby finally broke the deadlock with 15 mins remaining and the victory was then sealed when Ginola turned 2 men and then finished from the edge of the area with his left boot (he hit it with his left boot from behind his right leg) into the bottom right hand corner. Clayton said, "It was a deserved victory with a scoreline that flattered the visitors but one which certainly didn't tell the story of a vipers team back to their old selves." The Viper's Gaffer, who underwent emergency heart surgery two months ago, broke down in tears during an emotional first return to Battersea on Monday night to speak at the club's annual general meeting. He is expected to be back at the helm in late January or early February next year, and said: "I want to assure everyone that I am looking forward to coming back but I must follow the doctors' orders." Meanwhile, Matt Lloyd believes the Vipers's unity and motivation to win for the Gaffer will prove to be too strong for South Park on Sunday. Lloyd, who has become a firm fans' favourite since re-signing his commitment to the club the summer, says the players' will to win for their ailing leader and their commitment to each other will see them try to qualify for the Champions League. "Everybody was shocked that he (The Gaffer) got sick but we always wanted to keep playing and of course we are playing for the boss," he said. "This is one of the reasons we are playing so well and it shows he's done an excellent job on us and Esmond (Tweedie) is doing great job as well. "But the players and Esmond, and the staff as well, are working for the boss. Even if he is not here, we can feel him. Esmond is always bringing us news about him and we are often thinking about him." The Gaffer will be glad to hear, though, that Lloyd and the players are not being distracted by events off the pitch and are focused solely on the South Park game. "The strength of this team I think is our focus," he added. "We take one game as it comes, we always think about the next game coming up and not about the future. If we are to do well -and we want to do well in every competition - that's the attitude we have to take." Lloyd added that the three new signing are a real shot in the arm, adding that when the news came through, confidence surged through the squad. He said: "It's really good to know that Hill Wood is with us because he is a very good player. He showed that against us recently. England football hero David Beckham gave all Vipers a lesson in dressing for awards ceremonies last night when he was voted the BBC Sports Personality of the Year for 2001. The star was close to tears as he accepted the honour at a star-studded ceremony in London on Sunday. He was wearing a black suit, two earrings, a large white tie and white shoes while he thanked his team-mates, his 'nan' and wife Victoria for receiving the honour. He went on to make a special mention to his club manager saying, "There's only one man we all look up to." 08/12 JUNIOR VIPERS - WINNER. The correct answers are available by emailing the Gaffer. The match had it all: Goals, Saves, Chances squandered, Life-threating injuries... and Punches. In what can be only decribed as a fair result (with one flueky goal apiece from Van Custsem (mi) & Lucas) the match will best be remembered for the tussle between Josh 'the Nipper' Wilkins and Aidan 'I saw red' Cooney. Their respective managers happened to be the only ones "looking the other way when it happened". Sven Goram said, "I will have to see the video footage before passing comment and, if necessary, taking any action." Goals from Hill-Wood, Payne, Fetivea & Muir gave the Buchanan Scratch a 4-2 win over the Vipers. The match was tight with chances few and far between. Wood gave Buchanan's side the perfect start. The defender parried the loose ball goalwards and watched as the ball squirmed under Mike Sanderson's body. The Vipers responded equalising with a great free kick from Wilkins and went on to have the better of the first halves and Cadbury really should have put them 2-1 up having picked up a loose ball on the edge of the box. Payne then tucked in a ball parried by the busy Sanderson leaving the blues 2-1 down at half-time. The Viper's defence was solid but another unfortunate cross from Fetiveau managed to serve into the top corner. Ginola then created a great goal from nothing turning two of Buchanan's defenders but as the visitors threw everything forward in the closing stages in an effort to get their share of the spoils substitute Don Muir out jumped the Vipers defence to seal the Victory. Sven-Goran Cadbury's rejuvenated team recorded their first victory of the year yesterday. What is more, they did it with a flourish that saw them hit the Eton Masters for Five. The principal heroes of this superlative, startlingly easy win were two brothers, one who scored his first hat-trick for the Vipers, the other who rejuvenated the defence with the style and control that reminded many of a young Desailly. But the whole team deserved equal billing for the skill and determination with which they they inspired each other to the Vipers's biggest victory for almost a year and sweet revenge on a team that started a rut that lasted to the end of last season and the first two games of this one. There was an air of anticipation on the famous playing fields of Eton. The Duke of Wellington said the battle of Waterloo was won here and another high-octane clash between these two sides will provide the Vipers with staunch encouragement for the season to come. On this day the Vipers team took a similar shape to their friends at Chelsea with three Dutchmen forming the spine of the Team. Dinger (ma) up front, Van Weazel in the centre of midfield and Dinger (mi) making a superb debut at full back. James Parnell made his debut in goal, The Gaffer, Tractor, and Esmond resumed in defence, Will Duff Gordon linked up with Tris and Ginola in midfield, and Matt Lloyd formed the remainder of the spearhead up front. Their opponents, according to manager Duncan Bailey lacked just one of their players but his absence went no way to compensating the Vipers for the disadvantage of endeavouring to become the first team to beat the Masters this season. Predictably, The Vipers were under pressure from the kick-off but it inspired them, not the Masters. Coming out of their defensive crouch, Sven's men scored after only six minutes. Strangely, the goal emerged from what looked at first a hopelessly over hit pass by Tremayne. However, when Dinger picked it up there was only one place it was going to end up. The Masters ought to have equalised but both the steady hands of Parnell and the upright denied them in one goalmouth scramble. The Vipers took another scoring chance on the half-hour after a parried shot from Dinger fell to the Van Weazel who knocked it into the empty net. The Masters fought back but it was going to take something special to break down the Viper's defence. This came in the form of a long-range shot from Glen Pierce that was lofted perfectly over the head of the Gaffer and Parnell who was just a few yards of his line. Shortly before Parnell got down superbly to his right to stop the dangerous, left-footed Bailey scoring with a low shot from Reddington's clever lay-off. Instead, it was the Vipers who fought back. Lloyd sent the ball flashing into the far corner of the Eton net from just outside the penalty area before disappearing under a mass of ecstatic team-mates. Dinger then got the fourth leaving the Master's trailing 4-1 at the break. The Masters tried to use the width from the start of the second half, but it made little difference. The Vipers captain must take much of the credit here, not least for the way he marshalled hit troops as they fought to win the ball back. With The Masters falling apart, and Pierce verbally abusing his team-mates, the Vipers beginning to toy with them, one more goal came along to delight their large, noisy and almost disbelieving following. It was Dinger completing his hat trick after 77 minutes this time lifting the ball over the keeper. Bailey then dived to win a penalty but by this stage it was a mere consolation. Vipers manager Sven Goram was left seething last night as he saw his team fall to their second defeat of the season. Despite a performance by his team he described as "solid" he was forced to concede the points to his Punani counterpart Mike Treeman after the referee controversially didn't award his team a penalty. The incident, which happened when the Vipers were 1-0 up, resulted from a goal line clearance in which the Vipers player adjudged was saved by a Punani player's hand. The mood of the match quickly changed after that with the Gaffer seen raising his leg in a challenge with Hoffman (mi) and with Steel seen eyeballing Hoffman (ma). Punani, who have made some radical changes to their teamsheet following their last drubbing to the Vipers, were naturally delighted with their first ever victory of the slippery side. Charlie Gordon told reporters, "Well yeah, um, I'm uver the Moon. We take each game as it comes". Some Vipers, however, have already laid claim to the coverted end of season trophies with a suberb goal from Van Weazel and a dashing last minute save from Mike 'the Panther' Sanderson. TWO LATE SPECTACULAR strikes gave the Harrotians a triumph to savour as the First Division side sent Premiership Vipers to their first Worthington Cup defeat at this stage since 1996. The Vipers had come from behind in the first half, and they could have wrapped the game up inside the first 40 minutes but it was not to be. Harrotian manager William Francklin described the game as "a blast from the past Cup-tie - six goals, plenty of excitement, and, happily, it was us who produced that bit of extra magic when it mattered". Sven Goram Cadbury, the Vipers manager, said: "It was a cracking match that could have gone either way. We had chances, they had chances - and they took theirs, and full credit to the Harrotians." The first goal resulted out of a great interception of a pass between Methven and Clayton by Bonsor. A great cross was delivered from the right allowing Alex to hammer it past Dauman in the 8th minute. 1-0. Within five minutes the Vipers had equalised after some great running down the left from Lloyd opened up the home defence, enabling him to find the debutant Webb who slotted home his first Viper goal. 1-1. Shortly afterwards the same happened on the right with Dinger this time providing Webb with the service. 1-2. The Vipers were looking comfortable and the Harrotians had cause to be grateful to both their goalkeeper, Bill Fox, and some poor finishing from Webb and Lloyd for not going further down. But it was the Harrotians who capitalised on a Viper team that began to relax. The toll of only playing with ten men also began to show on the Vipers and as they tiered their passing and movement waned. The last fifteen minutes saw some great possession from the Harrotians and an unfortunate error by the Viper Keeper let the Harrotians back into the game. 2-2. Again the Vipers could and should have scored but it was the Harrotians who, despite seeing their star Martin Fiennnes limp off, took the honours with fine strikes in the 4th and 2nd last minutes of the game from Anthony. This was the Vipers first game of the season and despite some hard work in the close season it seems their manager has failed to overcome his team's shortcomings from last season. His Chairman has spent millions over the summer to give Sven the squad he said he needed to challenge for honours. However, on last night performance it remains to be seen how patient he will be with the young man once touted as England's future. The Lion's den of Inter Pun awaits him on Sept 30th. STOP PRESS: Harry Lucas has been fined an undisclosed amount and forced to travel in the team bus from now on by the Viper management following his non-appearance at last night's game. The Yugoslavian international was rumoured to have knocked down a Pizza Delivery boy in his 50,000 car on his way to the game. 10/8 Welcome Back from your Summer Rest. There has been much coming and going at the club this year. I am pleased to announce that we have signed three players for the forthcoming season - Dinger, Webb & Methven - adding further competition to the defence and strikeforce. Machin has been sent on loan to Orange FC, Colin has completed his move to the New York Jets, Matty has moved to Dulwich so he can be closer to the training ground, Clayton has been given a new contract (I couldn't boot him out in the same week his girlfriend did), Swan has been told to get fit or get out, Ginola is training hard (honestly) and Tris is currently seeing a specialist in Switzerland. 9/8 Join the Vipers Private Fantasy Football League. It is free to enter and they do all the work for you. Join Yahoo (if not a member) - Yahoo will send you a confirmation with further details once you have completed the registration process.